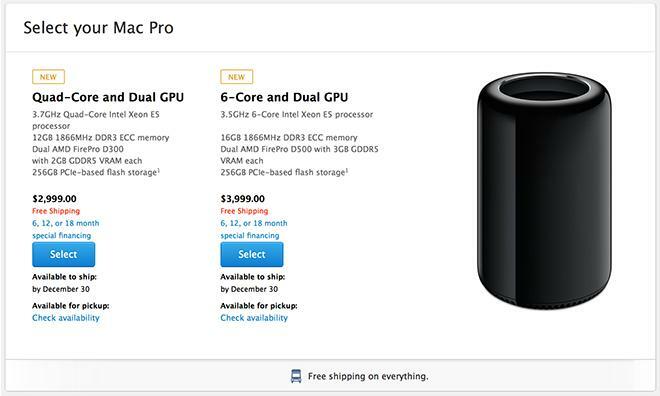 As promised, Apple on Thursday initiated sales of its highly-anticipated Mac Pro desktop, with some orders placed through the company's digital storefront shipping by Dec. 30. Supplies appear extremely limited out of the gate, however, with custom configured models showing delivery dates into February. Update: Reports are coming in that certain BTO configurations, especially those with maxed-out specifications, are showing delivery dates pushed back to the first week of February. 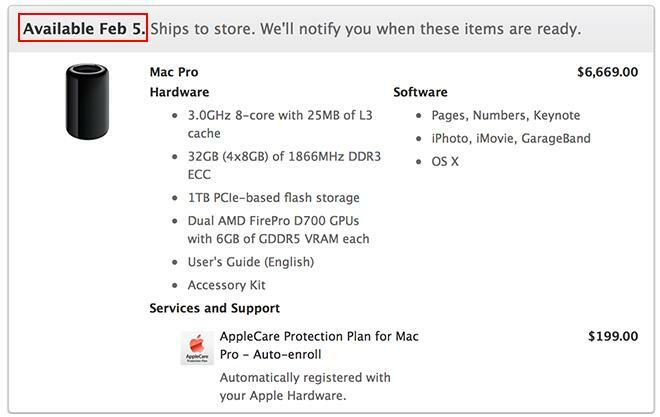 Specifically, one iOS developer in California, who ordered immediately after the Mac Pro went up for sale, is seeing a delivery date of Feb. 7. A screenshot of their order specifications can be found below. The official release of the redesigned Mac Pro has been a long time coming, but Apple finally kicked off sales of its cylindrical desktop as promised. With Thursday's opening of orders, Apple will just barely meet a self-imposed December deadline it announced in October as ship-by dates are set at Dec. 30 for base configurations, while build-to-order options push delivery into January. At launch, customers can purchase configurations starting at a base price of $2,999. The low-end version comes with a 3.7 GHz quad-core Intel Xeon E5 CPU with Turbo Boost speeds up to 3.9 GHz, dual AMD FirePro D300 GPUs with 2GB of VRAM each, 12GB of ECC DDR3 RAM, and 256GB of PCIe-based flash storage. A higher-tier model can be configured with 3.5 GHz 6-core Intel Xeon E5 processor with Turbo Boost up to 3.9 GHz, dual AMD FirePro D500 GPUs with 3GB of VRAM each, 16GB of memory, and a 256GB SSD. Base price for this model is $3,999. In addition to the standard configurations, build-to-order models are also available, with options including faster 8-core or 12-core Intel Xeon E5 processors, AMD FirePro D700 GPUs with 6GB of VRAM, up to 64GB of memory, and up to 1TB of PCIe-based flash storage. In addition to Apple, pre-orders are similarly now available from Apple Authorized Resellers MacMall and B&H Photo, which offer considerable savings when you take into account that B&H only charges sales tax on orders shipped to NY and MacMall only taxes orders shipped to CA, NY, IL, WI, MN, CO, TN, NC and GA. At roughly 8% average tax, that's a savings of at least $240 per Mac Pro for readers outside those states. 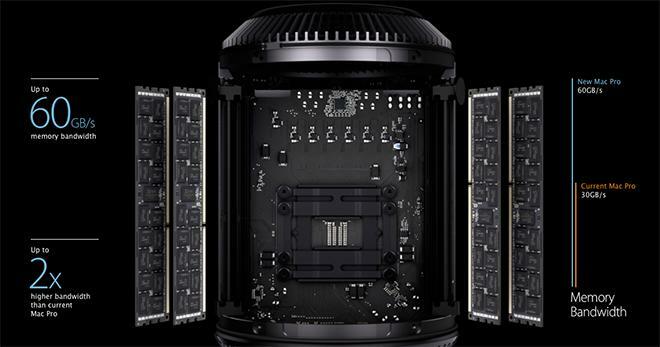 When the Mac Pro was announced in October, AppleInsider was able to get a hands-on look at the radically redesigned pro-level machine. 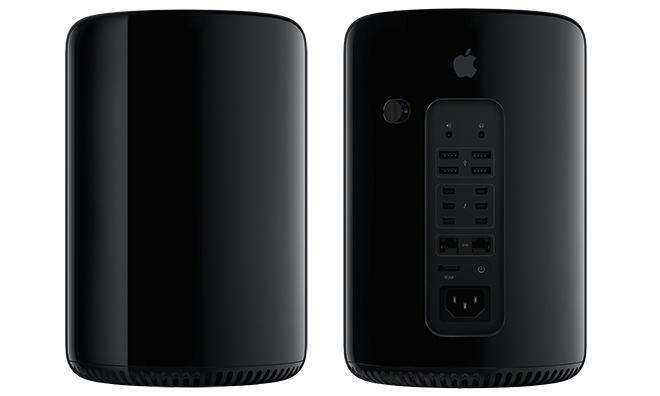 Instead of continuing with the boxy form factor of older Mac Pros, which carried over a design based on the PowerMac first introduced in 2003, the black aluminum cylinder has been completely rethought with an eye on future-proofing. At the core of Apple's new halo-computer is a triangular heat sink, onto which all major components and boards are mounted. The so-called "unified thermal core" is key to the Mac Pro's compact size, Apple says. As for components, the company went with a fast PCIe flash storage solution clocked at 1250MB/s. This compares to current SATA flash solution speeds of 500MB/s and SATA HDD's 110MB/s. Instead of swappable drives, Apple chose to lean on Thunderbolt 2 for storage expansion, a direction in which many professionals are moving with increasingly data-heavy workflows. The copious six Thunderbolt 2 ports join four USB 3.0 ports, two Gigabit Ethernet ports, one HDMI 1.4 port and audio in/out. For many, Thunderbolt 2 is likely the main attraction with support for 20Gbps throughput, up to six daisy-chained peripherals per port and backward compatibility with current Thunderbolt hardware. A host of components can be connected via Thunderbolt 2, including the recently released Pegasus2 RAID array from Promise Technology. Memory has also been switched to four-channel ECC DDR3 modules running at 1866 MHz, capable of supplying bandwidth up to 60GB/s. These speeds double those of the outgoing Mac Pro. All the internals fit into a svelte 11-pound chassis coming in at only 9.9-inches tall and 6.6-inches in diameter. The footprint of the machine is vastly smaller than the Mac Pro tower it replaces. At this time, Mac Pro stock levels are unknown, though Apple CEO Tim Cook tweeted on Wednesday that production of the desktop has ramped up at the Austin, Tex. plant tasked with manufacturing the computer.